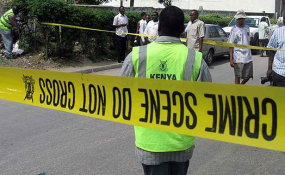 Police in Migori are investigating circumstances under which a 36-year-old man died after spending a night in a lodging with his girlfriend in Rongo town on Tuesday night. The man reportedly died at Rongo sub county hospital in unclear circumstances after having quality time at Msenera lodging with a woman identified as Dona Anyango. Rongo Sub County Police Commander Peter Kirui said the deceased, identified as Collins Odhiambo Ochieng, had spent the night with Ms Anyango before he died. He said after the man checked in with the woman, he developed breathing complications. "The woman rushed him to hospital in Rongo where he died while undergoing treatment," said Mr Kirui. He added that that Ms Anyango, who reported the matter to the police on Wednesday morning, is still being detained at Rongo Police station to help the police in further investigations. "The cause of the death could not be established immediately. Police have detained the woman in order to aid in investogations," added Mr Kirui. The body of the deceased was taken to Rosewood hospital mortuary for an autopsy. The incident left scores of Rongo residents reeling in shock. "It is strange that someone would die in such unclear circumstances. The police should expeditiously get to the bottom of the matter," said one of the residents. "It is very bad that what was meant to be an enjoyable evening would turn out tragically for the man," quipped another resident.